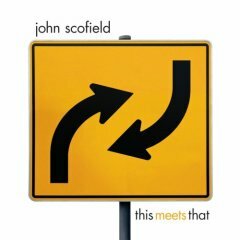 Playfully referencing his 1977 solo debut East Meets West, John Scofield opted to title his first effort for EmArcy This Meets That. Regardless, it also happens to be a rather fitting title for the collection. Throughout This Meets That, Scofield moves through a wide array of styles, merging them together with the dexterity of a master craftsman. He adds a little bop here and a little soul there, and he does it in a way that the endeavor’s moniker clearly was meant to highlight. Although the individual components ought not to fit together, Scofield uses his distinctive guitar playing to weave them into a cohesive tapestry of sound that shifts from songs with slinky grooves to those that exude an air of meditative beauty. In taking his longstanding trio, which includes drummer Bill Stewart and bass player Steve Swallow, into the studio for the first time since 1996’s Quiet, Scofield rediscovered the emotional core that was missing from most of his recordings for Verve. He has referred to Stewart and Swallow as his "A-Team," and over the course of This Meets That, it’s easy to hear precisely why his proclamation rings true. Augmented by a quartet of horn players — Roger Rosenberg on baritone sax and bass clarinet, Jim Pugh on trombone, Lawrence Feldman on tenor sax and flute, and John Swana on trumpet and flugelhorn — Scofield’s outfit demonstrates its versatility and its virtuosity without ever sounding stuffy or conceited. There undeniably is a well-established, unspoken connection among the musicians, and as a result, the entirety of the endeavor unfolds seemingly without effort as the ideas introduced in one track lead to those expressed in the next. On opening cut The Low Road, Scofield and his accompanists settle into a supremely funky stew that draws heavily upon Miles Davis’ fusion experiments. From there, the group plunges headfirst into Down D as the notes that spring from Scofield’s guitar gracefully paint spiraling patterns of liquid color against the gently wavering crimson backdrop supplied by the rhythm section. The mood that is evoked — both here as well as on Shoe Dog — undeniably taps into the same spiritual yearning as the flights that frequently were taken by the Grateful Dead and the Allman Brothers Band in the early 1970s. With the New Orleans-inspired Heck of a Job, Scofield slyly pokes fun at the Bush administration, and on Strangeness in the Night, his guitar solos sweep across the terrain in ways that are reminiscent of Miles Davis in his post-bop days. Elsewhere, Scofield’s lyrical phrasing on Behind Closed Doors captures all of the country-soul loveliness of Charlie Rich’s smash hit; The Rolling Stones’ Satisfaction is concisely rendered as a jazzy, R&B-laden gem; and with the help of Bill Frisell, House of the Rising Sun is delivered as a brisk, swinging blues excursion. To his credit, Scofield doesn’t try to weld any new tricks into the DNA of This Meets That. Instead of forcing himself upon the music, he trusts it to lead him and his ensemble wherever it wants to go. In the end, his eclectic approach speaks for itself, and as a result, This Meets That becomes one of the stronger and more consistently engaging outings in his canon. This Meets That is available from Barnes & Noble.